We don't simply teach you how to build a few anchors—we teach you the fundamentals of anchor building. You've heard the adage about gifting someone a fish versus teaching them how to fish, and that's what we're talking about here. After you understand how to build good anchors, we're going to move into a 4-part rescue scenario. The skills taught during the rescue scenario build on the information you just learned about anchors, and teaches how to escape a belay, take over a belay, ascend a fixed line (to an injured partner), and finally how to do a counter-balance lower with your injured partner. If you are humble enough to understand that there's a lot to learn before taking your friend's climbing at the local crag (and smart enough to not tag along with untrained/unknown climbers) and you are thirsty for knowledge, this is the workshop for you! We provide all the tools and equipment you need to become a proficient, competent and confident anchor builder in Trad, Sport and Top Rope environments. Our only requirement is that you come prepared to THINK. We will teach you proper knots, anchor techniques, site selection and belaying techniques in both top and bottom managed sites. We will geek out on the physics of anchors, angles and kilonewtons (kN). 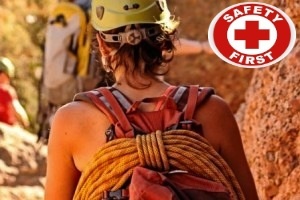 We will teach you self rescue and partner rescue techniques. We will discuss safety at the crag, the ethics of climbing outdoors, and how to identify un-safe situations to protect yourself and your climbing partners. We'll be climbing at Mission Gorge in Mission Trails Regional Park. The climbing area is located about 30 minutes drive from downtown San Diego. We will send you driving directions the Friday prior to the class and will meet you at the cliffs at 8:00AM. 8:00 AM - Arrive at the climbing area; check-in; final gear check.